"Don't believe a word. They're just rumours or speculations". That was what the Human Resources Minister clarified to the media in Kuala Lumpur, Tuesday. According to him, no decision has been made yet by the government on the age limit for the Employees Provident Fund (EPF) withdrawal for private sector employees. 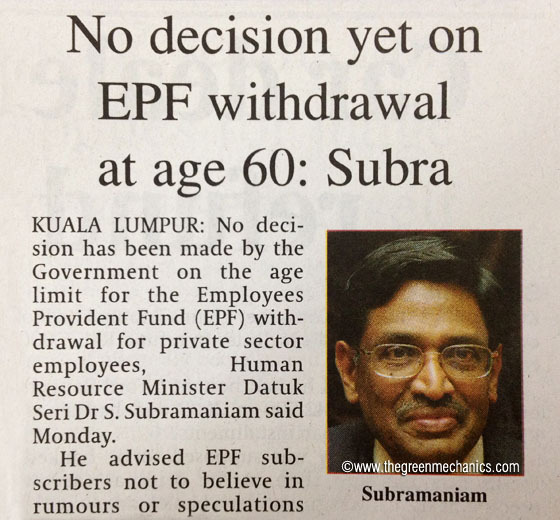 KUALA LUMPUR, June 18 -- No decision has been made by the government on the age limit for the Employees Provident Fund (EPF) withdrawal for private sector employees, Human Resource Minister Datuk Seri Dr S Subramaniam said today. He advised EPF subscribers not to believe in rumours or speculations that those from the private sector could only make their EPF withdrawal after they had reached 60 years old. He said this in response to concerns raised by EPF subscribers over the age limit for EPF withdrawals, following the tabling of the Minimum Retirement Age Bill in Parliament last Wednesday, which set the minimum retirement age for private sector employees at 60, effective January next year. Speaking to reporters after opening a seminar on improving the administrative system of Social Organisations here, Subramaniam said the ministry understood the concerns raised by subscribers and would discuss the matter with the EPF. In another development, he said the ministry was in discussions with EPF to introduce a special pension scheme for private sector employees to address the problems of poverty and the high cost of living once they retire. "No decision has been made and we will continue to discuss the matter with the EPF," he added. The Minimum Retirement Age Bill should be a straight forward exercise which should not be complicated with tying it with the EPF withdrawal rules. Rumour has it that an employee would finish up his EPF retirement savings just after 3 to 5 years from the withdrawal date. If that is the reason for the rumoured extension of EPF withdrawal age to 60 then I feel it is very unfair on the part of the government. You (the govt) have already extended the minimum retirement age from 55 to 60; meaning you've taken care of additional 5 years of that employee's welfare. Moreover, during the additional 5 years of working the employee is fully contributing to his 'extended' retirement coffers. Leave the man (and woman) alone. Let him withdraw at current age limit of 55, remember it's his money he's been saving according to the law till age 55. Don't amend the law to withhold what is rightfully his. It's still a long shot but I want to state what I want for myself long in future: I want my money at 55 and not 60. I am fully entitled to it and I want and can manage it better than EPF does. Datuk Subra, since you said it is only rumours but how come your fella minister announced today that full withdrawal only eligible at age 60 ????? Left hand do not know what right hand is doing?? Shame on you.